It wasn't Alexander Pezzini who found the artifact. It was the artifact that found him. The NYPD homicide detective found himself in a shoot out in one of New York's many museums, when a glass case broke and an old bracelet fell out on the floor. Bullets buzzing past his ears, Alex found himself picking the bracelet up and putting it on his right hand. It expanded into a gauntlet. Soon, to his utter amazement, it covered his whole arm, and he could deflect the bullets with ease. One of the ricocheted and hit his stalker in the head. When his partner Jack McCarty finally appeared at the crime scene, the gauntlet had shrunk to its original size and Alex forgot all about it. Later that night, however, he got a strange phone call from one of the city's most obscure millionaires, the enigmatic Kenneth Irons. "I am told you have the Witchblade," Irons said. "The what?" Alex was a good cop. Even crazy phone conversations could bring up useful information. 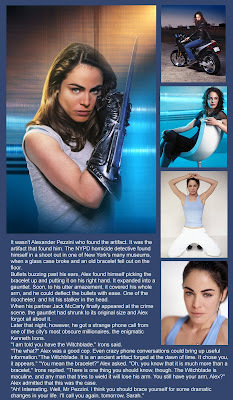 "The Witchblade. It is an ancient artifact forged at the dawn of time. It chose you, it appears." "You mean the bracelet?" Alex asked. "Oh, you know that it is much more than a bracelet," Irons replied. "There is one thing you should know, though. The Witchblade is maculine, and any man that tries to wield it will lose his arm. You still have your arm, Alex?" Alex admitted that this was the case. "Ah! Interesting. Well, Mr Pezzini. I think you should brace yourself for some dramatic changes in your life. I'll call you again, tomorrow, Sarah." Alex looked at the receiver, baffled. Sarah? WTF? He had some strange dreams that night. He could see a woman in medieval armor. Then the same woman being burnt at the stake, and it was as if the pain of her flesh burning was his own. He did not know that the Witchblade was embracing his whole body, changing every single cell. When Sarah Pezzini woke up the next morning, a new tale had begun. This one is for Alex, a great admirer of Witchblade, the comic. Click on the cap to enlarge! Alexia has given me a continuation of this story that I just had to give you right away. I am Dani the dancer now. I remember when you wrote this for me at the Haven. Witchblade has become one of the best comics under the great writing direction of Ron Marz. Have you seen Dani? The War of the Witchblades is going on right now. This was a great caption. Guest Cap: Shhh, don't fight it! Guest cap: Protect your password!